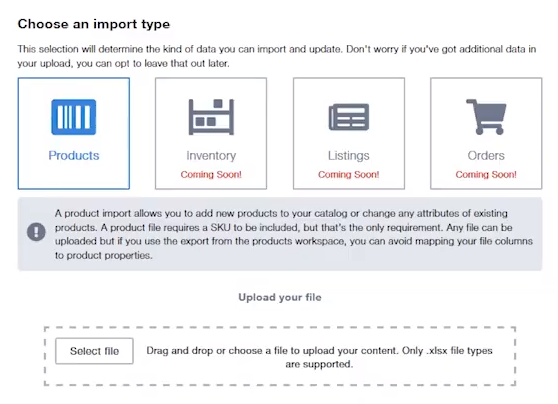 How to create new products and update existing product data using our brand new import workflow. Welcome to our video tutorial on the new SellerActive import process. This feature release offers an important upgrade that will allow you to create new products and update existing product data using our brand new import workflow. To access our import tool, navigate to your product workspace and click on the “Import” button located just above the grid. The only selection from here will be the Products import as our inventory, listings, and orders import are set for release in the near future. After clicking on Products you will select a file for upload or drag and drop a file of your choice. One of the great advantages to this tool is that you will not need to follow a strict template structure as we’ve built a column header mapping process that you will see shortly. After uploading your file, our system will begin a preview process that will give you a snapshot of your file contents and allow you to change the column mappings. If our system recognizes a column header in your file that matches with a SellerActive product attribute this will show as automatically mapped. In this example, the file I uploaded has a column header for SKU and Title that matches our system. If we do not recognize a column header then you will need to choose a property name that matches the data you are uploading. After this is complete, click next and our system will redirect you to the “Imports” page. Here you will be able to monitor the progress of your upload and download a results file upon completion. We are excited to offer this new process to our users and look forward to offering more file import options in the near future!